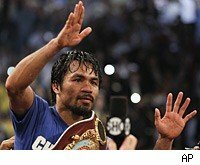 by Michael David Smith Manny Pacquiao showed once again why he's the biggest attraction in boxing, dominating Shane Mosley on Saturday night to win a one-sided unanimous decision in the biggest fight of the year. Although Mosley came out fighting hard with a good first round, it was all Pacquiao from there on. Pacquiao knocked Mosley down in the third and dominated the fight throughout. Technically Mosley knocked Pacquiao down in the 10th round, but in reality Pacquiao fell when Mosley tripped him, and the referee made a mistake in calling it a knockdown. In reality, Mosley never had Pacquiao in any trouble, at any point in the fight. All three judges awarded it to Pacquiao by lopsided scores: 119-108, 120-108 and 120-107. According to the pay-per-view broadcast, Pacquiao landed exactly 100 more punches than Mosley did (182 to 82) and threw more than twice as many punches (552 to 260).